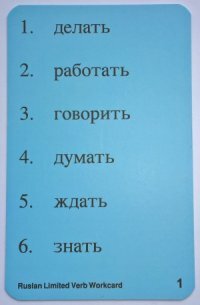 This is a set of four Russian pronoun dice, four number dice and 26 verb workcards, which is enough for four small groups of learners to practise conjugating up to 156 Russian verbs. The game comes with cards, dice and an instruction leaflet in a small plastic box 10 x 6 x 4cm. It will be demonstrated at the UK Russian Teachers Group meeting in London on Sunday March 4th 2018 - www.thertg.co.uk .